RFID Power from the Leaders In Windows Label Printing enough for beginners. 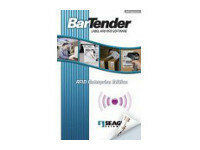 Now BarTender takes the next step, with RFID encoding features that uphold a tradition of fl exibility and ease of use. Use simple mouse motions to “drag and drop” RFID objects into your label design the same way you would create bar codes and other label objects. Select from EPC Gen2, EPC Class 1, ISO 18000-6b, ISO 15693, Tag-It, I-CODE, TagSys, My-d, and Picotag. With the “ghosted” outline of the RFID antenna, chip and substrate displayed on screen, you understand in advance whether you are placing any label objects in an undesirable location. Our predefi ned label stocks come with graphic fi les that show the appropriate outline image, but you can supply your own custom images as well. Because RFID is a new technology undergoing rapid development, additional applications and enhanced capabilities are inevitable. Fortunately, key BarTender functionality is provided by printer driver and component modules that are often upgradeable by free download. This makes it less likely that you will need to purchase upgrades of the full software package in order to comply with minor changes to available RFID tags and standards. International Use When encoding text into an RFID tag, you can select from 20 different codepages from around the world, including Unicode (which supports most characters from most of the world’s languages). The RFID Enterprise Edition supports most of the tag types available in today’s RFIDcapable printers. This includes EPC Class 1, Gen2, ISO 18000-6b, ISO 15693, Tag-It, I-CODE, TagSys, My-d, and Picotag. (Because new tag types are undergoing rapid development, please check with us regarding the most up-to-date compatibility.) Data Formats for Wal-Mart, DoD, EPC, and more Most RFID tags allow data to be encoded in a variety of formats. Formats currently supported by BarTender include DoD, SGTIN, SSCC, GIAI, GID, GRAI, and SGLN (for both 64 and 96 bit tags). You can also specify your own custom RFID data formats. The adoption of the UHF Generation 2 standard by the EPCglobal consortium is a key development in the march toward broader adoption of RFID technology. 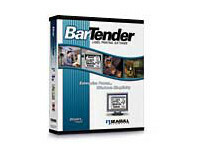 Because BarTender is fully Gen2 compliant, you can use it with RFID-capable printers from a variety of manufacturers. BarTender also supports numerous printers and RFID tags based on established “Generation 1” technology. BarTender has developed a world-wide reputation for making even advanced label design features intuitive enough for beginners. Now BarTender takes the next step, with RFID encoding features that uphold a tradition of fl exibility and ease of use. Use simple mouse motions to “drag and drop” RFID objects into your label design the same way you would create bar codes and other label objects.